For a number of years, Amata, Lucantonius and I have been making regular trips to Sheboygan, one of our favourite towns in the wonderful state of Wisconsin. Following in this thread will be posts on some of the places we love to visit there for food shopping and dining. If you're going for hard rolls on a Saturday, you can call in an order the day before; otherwise, get there early, before they sell out. philw -- I'm very happy to hear you enjoyed your visit to Miesfled's! And thanks for bumping this and reminding me that I have a few more posts to add to this thread! 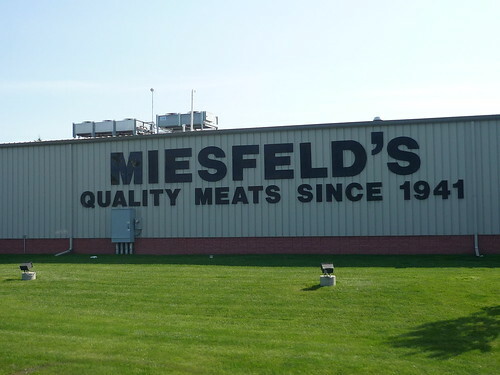 Great post, I've never been to Miesfeld's, but have enjoyed their products a number of times. I almost made it once, but arrived just after they closed. 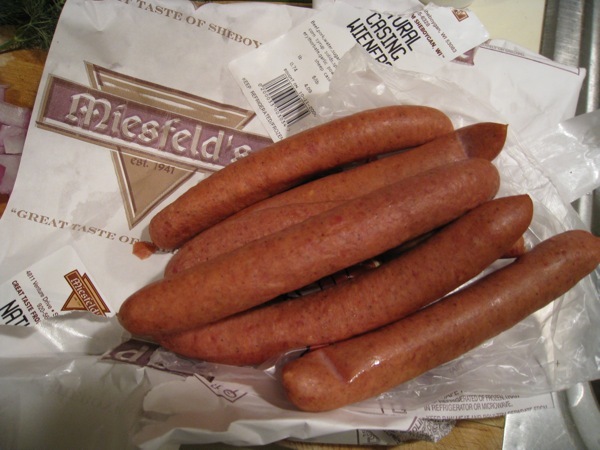 I do wish to echo the Miesfeld's hot dog love. Had them for lunch today, seriously one of the best hot dogs around. Distinct natural casing snap with accompanying spurt of juicy goodness, noticeable spice and a solid hit of garlic. Barry Sorkin of Smoque BBQ is the person who originally turned me on to Miesfeld's hot dogs. Considering Smoque's Mikeska Texas sausage is a favorite, I'd say Sorkin knows his way around encased meats. Love the Packer jacket in the third picture! Many thanks regarding the post! As I've said before, I love Wisconsin! 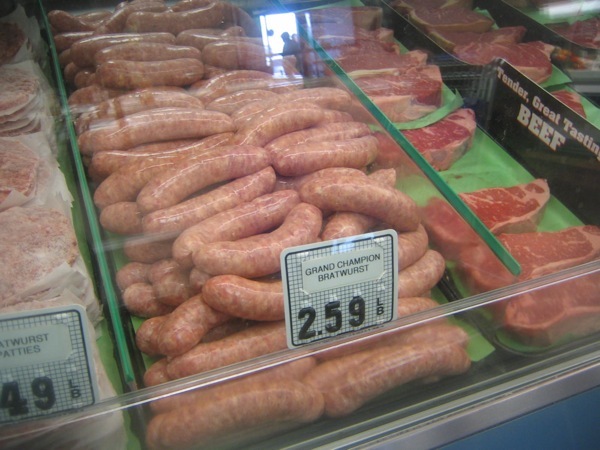 Although I've never had the pleasure to visit the meat market personally, I was introduced to the brats long ago when I lived in Whitewater. From that point onward, I've always had one friend or another re-supply me, including now in KC. The World Champions are my world favorites. I've never had the hot dogs but your and Gary's comments have convinced me that I need to get some of those this season, along with the brats. One question: it looks to me that in one picture you are indulging in what Wisconsiners call "cooked brats" (which in Germany would be true bratwurst, probably with some veal in them)—could that be right? If so, a comment or two in their regard would be welcome, since I've never had them. A few months ago I visited Sheboygan for the first time. In less than six hours we were able to check off many of the major local food groups—cheese, meat, bakery, and bakery with meat. Also a little Hmong food but that isn't yet an official category. In previous visits to Wisconsin I did the artisanal cheese thing—Wisconsin Cheese Festival, Fromagination in Madison and Larry's Market in Brown Deer. This time it was factory cheese. 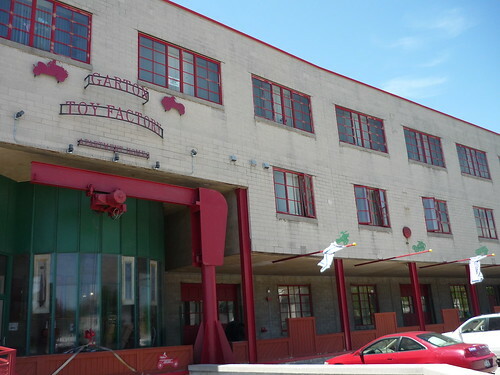 What better place to get it than a cheese factory? Gibbsville Cheese Company, family owned since 1933, is a relatively small producer about ten miles southwest of Sheboygan. There's little to distinguish many Gibbsville cheeses from generic supermarket varieties except price. Many, including the mystery cheese, sell for $2.20 per pound or slightly more. I think their super sharp cheddar (an extravagant $4.30 per pound) is pretty decent and a great value. Oddly enough, this wasn't my first encounter with mystery cheese in Wisconsin. Here's a wedge I saw at a street fair in Milwaukee. In the dairy category, we passed up our chance for frozen custard but Randall's seems to be the local favorite. At Randall's we ordered a bowl of chili, highly recommended somewhere on the internet. What we got was a bowl of tomato and ground beef soup with beans. Clearly made in house and not the worst thing I've eaten but not even close to chili. 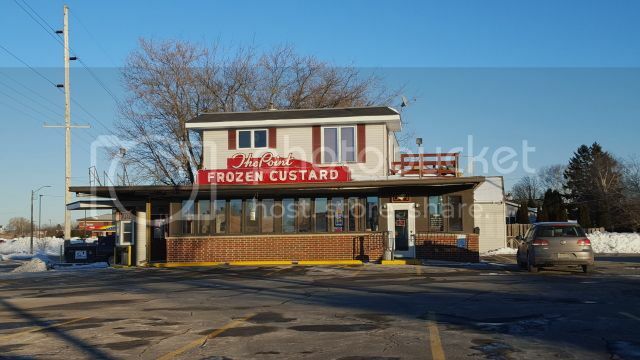 I trust their custard is the real thing. Unfortunately Miesfeld's Brat Haus wasn't in operation but the market didn't disappoint. It would be understandable if the local hunters were sick and tired of being treated like second class citizens, being forced to drag their deer carcasses around to the back door. 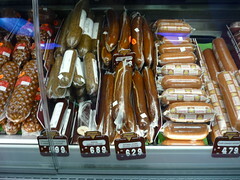 All sorts of nice bratwursts and summer sausages as well as nice looking fresh and smoked meats are on display. I was tempted by the ham grenades but gave in to the rindawurst. Good stuff, slightly scrapple-like but without the filler, takes on a beautiful crust. Charcoal Inn serves Meisfeld's brats and steaks. We chose the original north location [edit: actually the south location opened first, in 1984, 3 years before the north] and were a little suspicious because the parking lot was empty at noon on a weekday. The crowd steadily built and the lot was overflowing by the time we left. Their steak sandwich is served on the usual Sheboygan "hard roll," really rather pillowy and capable of soaking up a lot of juice. Let's have a look under the hood. That's butter, not mayonnaise. Maybe a little excessive but pretty good eating. Those Miesfeld's sandwich steaks are good. Charcoal Inn is best known for grilled Miesfeld's brats, so a double it was. 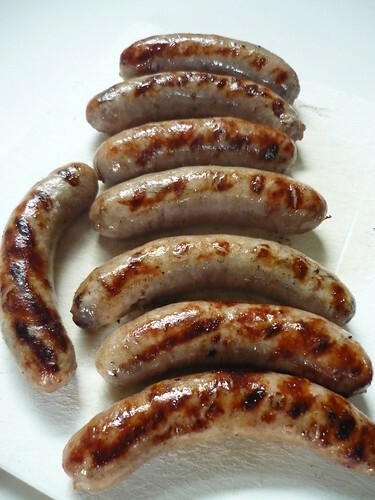 Without a doubt the best bratwurst I've had, juicy as can be with a nice charred crust. Both sandwiches were terrific. We also tried a brat burger at Shuff's, about a mile south of Miesfeld's where they are made. 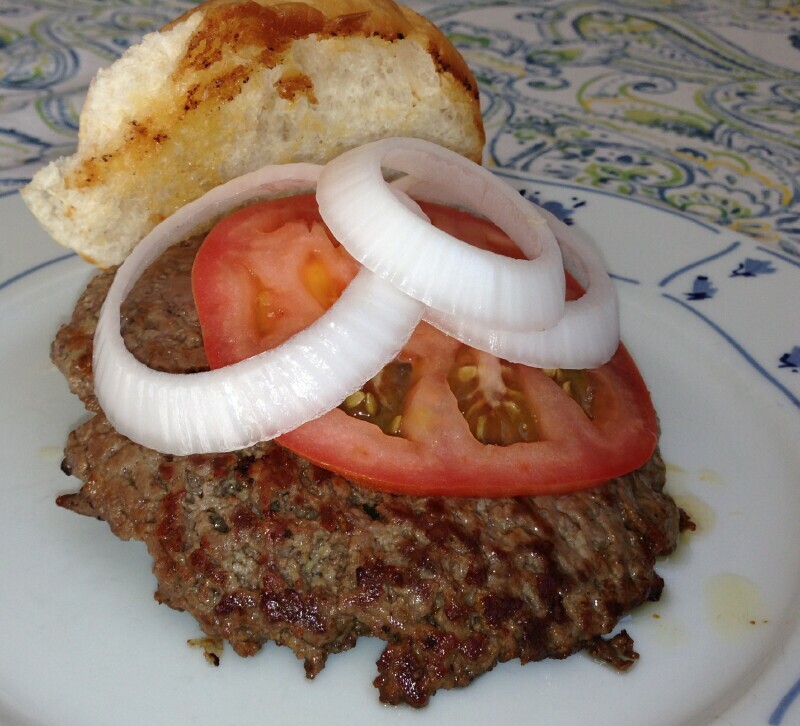 A beautifully grilled patty on a nice fresh roll (baked in house). I would have been even more impressed had I not tried Charcoal Inn's version right before. 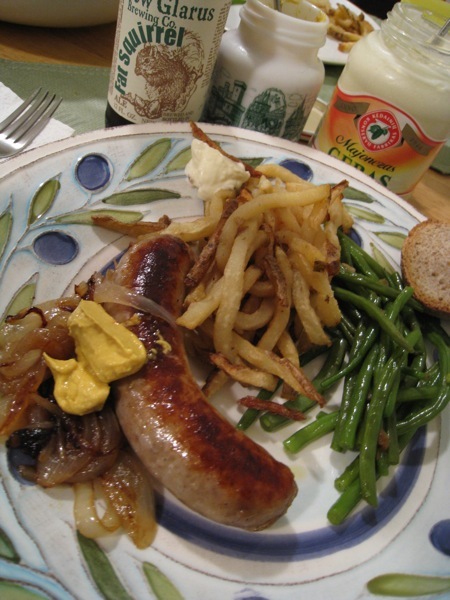 There's a reason why Sheboygan brats are famous (and it's not Johnsonville, or at least it shouldn't be). 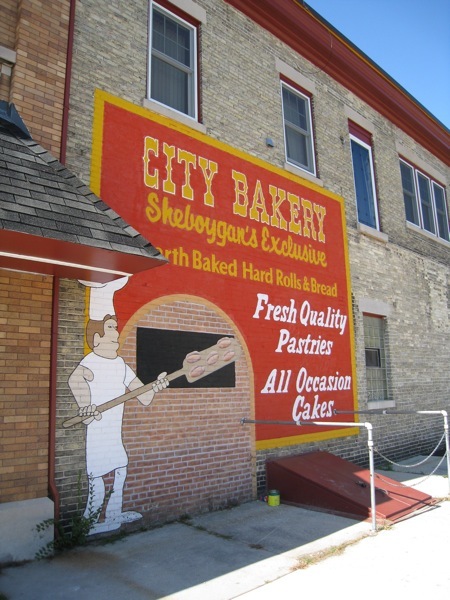 The Sheboygan area takes baked goods seriously. I wonder if there's another part of the country so well provided with old-fashioned neighborhood bakeries. Oostburg is a small town about ten miles south of Sheboygan. 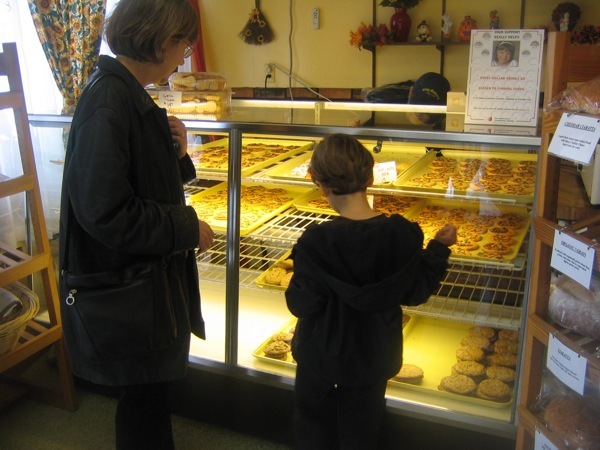 Even though its population is below 3000, it has supported an excellent bakery since the 1920s. One Oostburg specialty is the Persian—a spiral cinnamon roll topped with white frosting (chocolate is an option) and chopped peanuts. I would have enjoyed it a lot more without the frosting and peanuts (keep in mind I don't have much of a sweet tooth). The elephant ear was impressive with wonderful contrasts of textures—flaky, chewy and crisp, sometimes in the same bite. 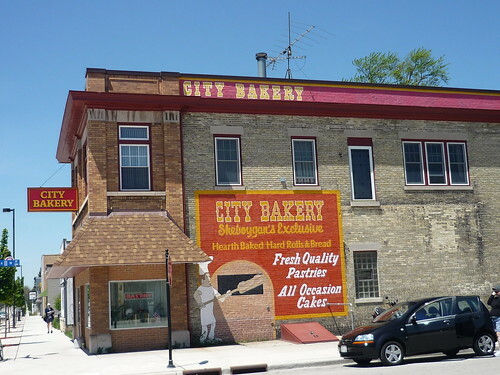 City Bakery is probably Sheboygan's best-known bakery but it's far from the only one. 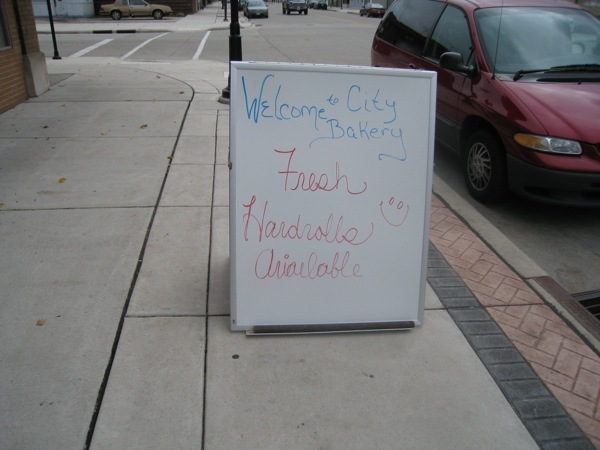 We tried some unfamiliar (to us) items advertised on their sidewalk sign. The peanut square was not a favorite of mine. A sweet light-textured cake cube completely coated in sweet white frosting and crushed peanuts. One bite and done. 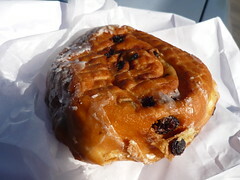 The blackberry fritter was much better. 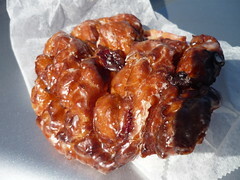 I don't know why this fritter variant isn't more widely available. Given the area's fondness for meats and sausage and for bakery, it should come as no surprise that the two are often combined. 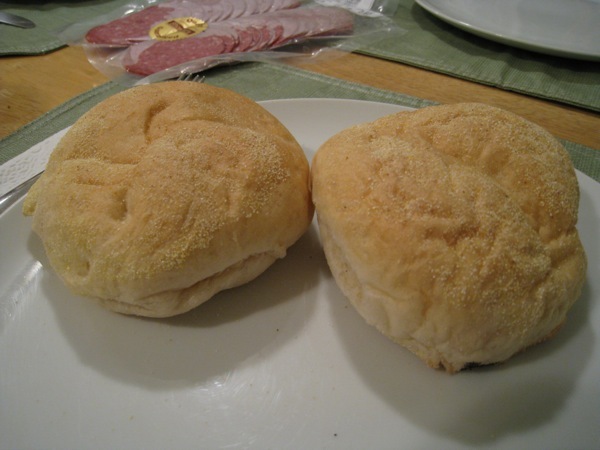 One of the specialties at Oostburg Bakery is wurstbrok, a minimally seasoned white sausage baked in a slightly sweet yeasty roll. Warm 'em up, apply mustard and you're in business. City Bakery makes fleishbrok—ground beef, cabbage and onions encased in a very good crust. This is a very tasty snack, more interesting than it sounds. Shuff's Last Resort has an in-house bakery that makes fleishbrock (I'm using each bakery's spelling). Not quite the equal of City Bakery's version but another fine snack. Wandering aimlessly around Sheboygan I spotted the attractive sign for Toy's Special Eggroll. I was excited by the prospect of a taco eggroll but my hopes were dashed when we saw the newer sign around the corner. It turns out Toy's is a grocery store carrying a wide range of food. 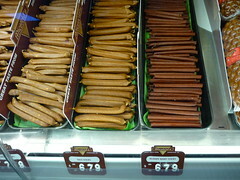 Most of the goods are Asian but Toy's stocks many Eastern European products and others as well. An appealing cultural mish-mosh. 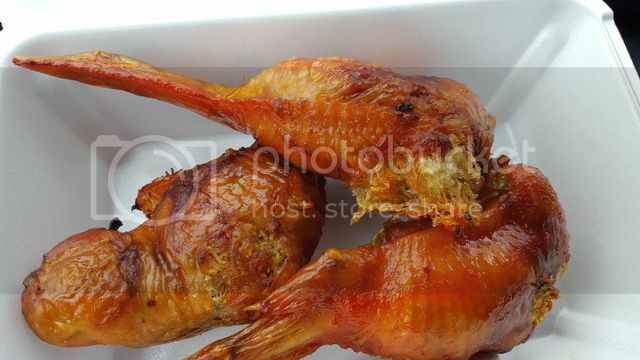 I suspect the store caters to many Hmong, as these chickens and many other products suggest. 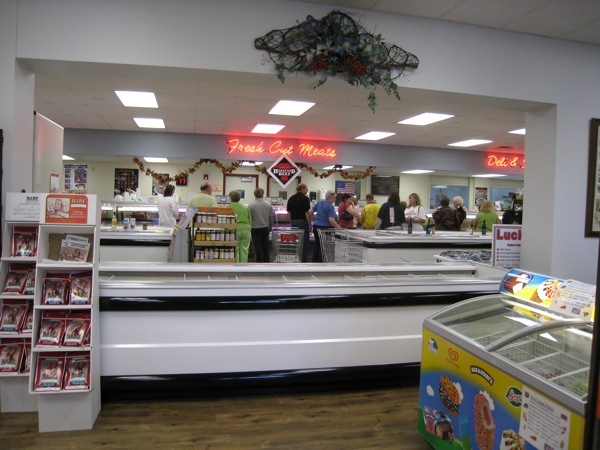 Toy's has a counter of prepared lunch items, many Hmong-style. The stock was depleted by afternoon but we were able to try some spring rolls. It was no taco eggroll but good nonetheless. Sheboygan is a most excellent destination for a daytrip or longer stay. Edited to correct name of original Charcoal Inn location. Last edited by Rene G on December 4th, 2011, 9:40 pm, edited 1 time in total. 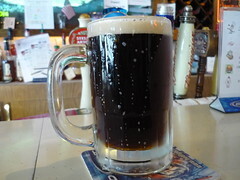 Rene G wrote: Sheboygan is a most excellent destination for a daytrip or longer stay. Yep Yep. Somehow this terrific thread got pushed down and lost in the onslaught of other (WI) topic threads over this past summer, kind of like how Sheboygan gets overlooked alot. Its the damn name, must of been pissed at the parents as a kid. 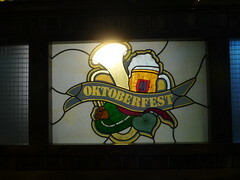 It's that time of the year for Oktoberfests and Sheboygan's gotta good one. We stopped in here this past June when riding the lake up north towards where WI meets MI. 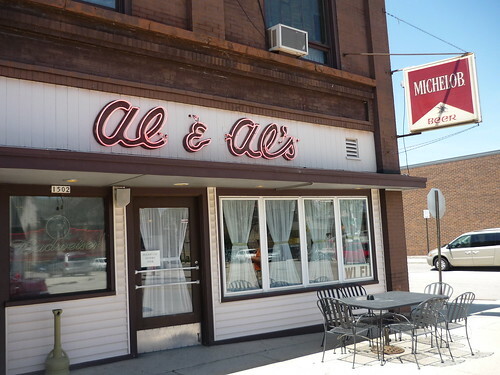 PhilW wanted to say hello to Paul, the owner over at Al & Al's which he has posted about before. We stopped in around lunchtime and sat at the bar to say hello. His wife was working two large parties, one was the local alderman trying to convince her wife to run for city mayor. The current ones been in the news of late. But as we could see, she's busy enough running the restaurant. The other large group was a woman's golf outing. We sat at the bar but there's a full dinner menu here and a couple large dining rooms. We eventually got a hold of Paul and he remembered Phil immediately and was happy to see us. We were just stopping in to say hello but that turned into a few beers and a sandwich, or two. 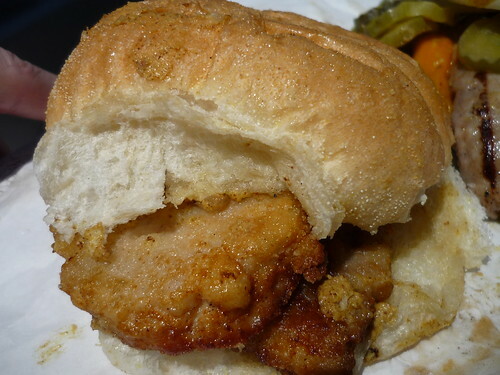 Their schnitzel was amazing and one of the best sammy's I've had all summer. Perfectly fried tender pieces of what I believe were veal placed inside one of Sheboygan's famous hard rolls and topped with crisped up extra buttered diced onions and some brown mustard. So good we ordered another for the road. We also enjoyed Spaten's Optimator, seen in pic above, it's a great tasting beer that's very similar to root beer except with the alcohol. Al & Al's hosts an Oktoberfest every year in which the entire area around the restaurant shuts down and the streets are crowded and flooded with beer booths and food from Al & Al's. Paul puts the whole thing on with his wife and local help for 1,000's of visitors. One of Wisconsin's best fests or so I was told. I'm going to try and go. According to facebook it's Friday Sept. 30th 2011. I'm not sure if they do it Saturday too but I think they do. We managed to wander around and take in the town while sneaking in a few more food stops before we made our way to Green Bay. 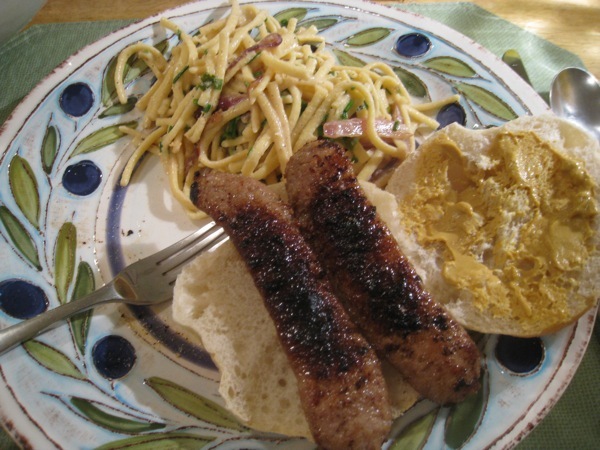 Some great brat burgers in the land of bratwurst can be seen HERE. 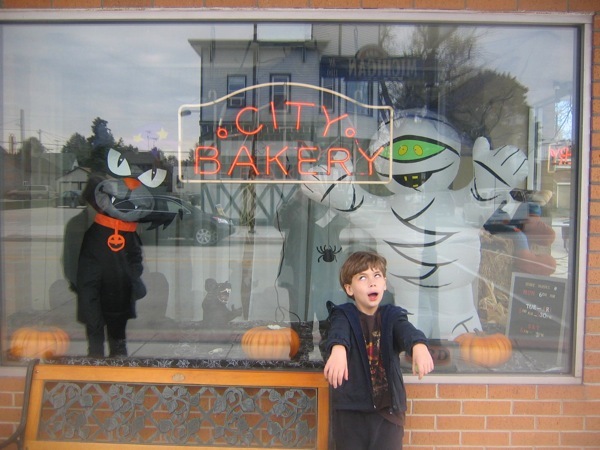 As pointed out in this thread Sheboygan has an abundance of great bakeries. I look forward to trying the lesser known ones on my return trip, thanks for the tips above all. This past trip I finally got to stop in at City and it was awesome. Living up to the hype their baked sweets were as good as any I have had. 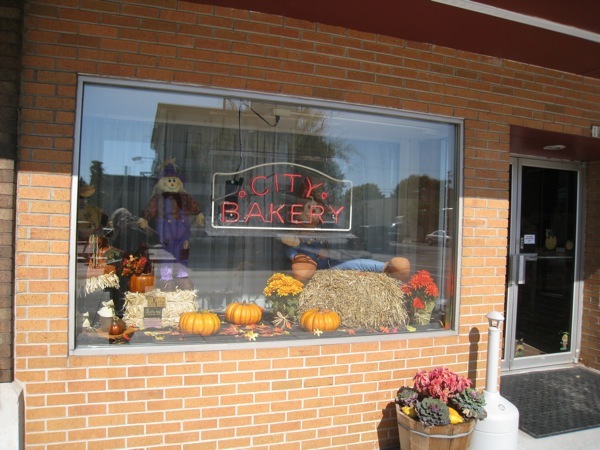 Along with Bleodow's in Winona, MN this is my favorite bakery to date. The hard rolls I brought back were outstanding and even though others weren't a fan of their signature peanut crumble, seen upthread, I thought it was great. Everything was actually and I got alot spending around $12, which can be hard to do shopping for one, prices are great. 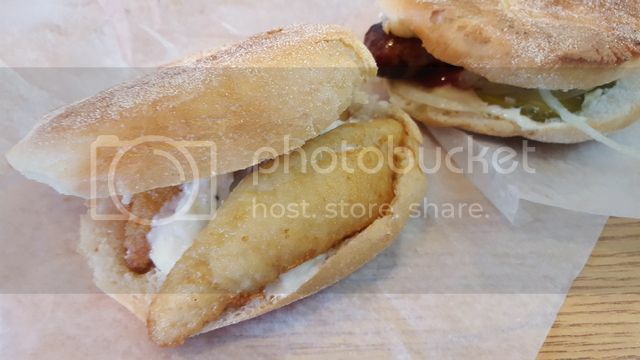 Aside from brat's and bakeries Sheboygan is also known for their steak sandwiches. They serve them at all the local fast food spots and taverns just like they do brats. Although there a little different and as noted above are a signature of Miesfeld's, the great butcher shop in town. 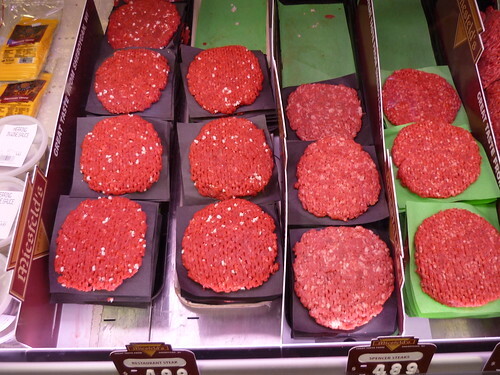 More similar to a hamburger than steak patty theres still something about these "restaurant steaks" as they're called. 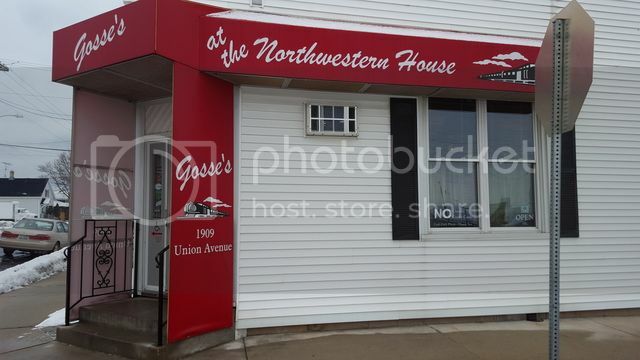 They make really good tavern food and so some locals will say, "Gosse's gots the best." It's a tavern located in whats also a historical landmark. The building was built in 1927 to accommodate railroad workers offering them a nice place to sleep, get clean and eat while waiting to move on to Chicago via the Northwestern Railroad. I only had time for a quick brew as I waited for my sandwich and although daytime hasn't prevented bars in Wisconsin from being packed, it was quiet on my visit. 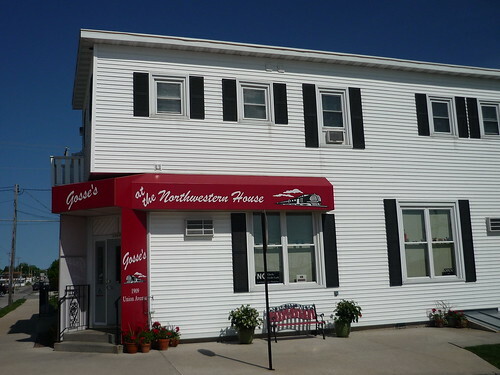 Gosse's started out as a drive thru in a tiny building popular for their broaster chicken, brats and steak sandwiches. The place was lost in the "Great flood of Sheboygan" in 1998. After taking a little time off the husband and wife team couldn't live without being in the restaurant biz and opened the tavern in the old hotel in town. Nice place inside and I could see this being my usual Friday night dinner and drinks stop if I lived in Sheboygan. 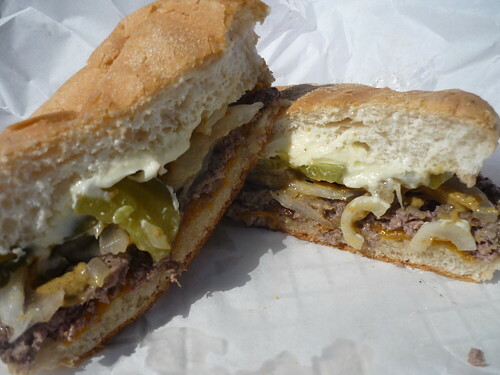 The cheesesteak sandwich is a restaurant steak with some WI cheddar served on a hard roll with lots of butter. Looks pretty plain and usual from the outside but those restaurant steaks are great as are the local cheddar and hard rolls. Like everything else they go heavy on the butter but they use raw onions and they worked well with pickles, mustard and patty. Next time I'll give some other stuff a try including another local specialty, torte's, Gosse's are homemade by the owners mom and they offer up to 20 flavors, I forgot to try one this time around. 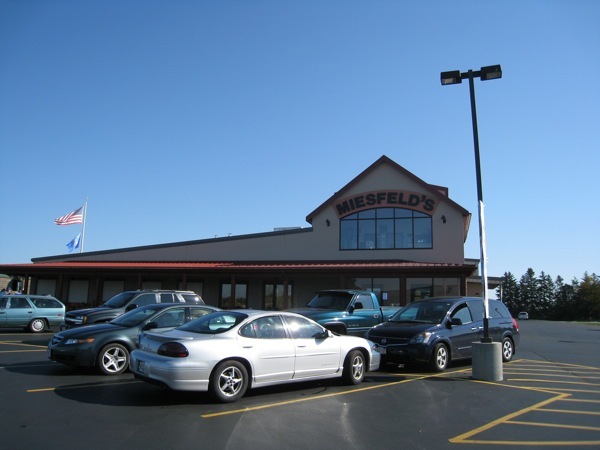 Of course no trip to Sheboygan is complete without a stop at Miesfeld's. Your going to want to bring a cooler and when you do remember your going to want a big one, not a small. There's so much selection at this wonderland of wurst. There's not much else I can add about Miesfeld's, I even took the same picture above asking hunters to please drag their carcasses to the back door. But I will reiterate this is a really great place. Famous for their grand champion brats but they offer a whole lot more including their famous restaurant steaks and brat patties too. They supply many restaurants around the area as well as houses. I'd be here every week if it was near me. I still need to do a head to head taste off until I decide who's brats are best but I love theirs here. Also I'm not sure I personally will ever find a hot dog I like better than Vienna Beef natural casing ala the greats (Demon Dogs, Gene & Jude's, 35th Street, Jimmy's etc) but Miesfeld's as noted makes great wieners too, just don't take a twitpic of theirs and then send it out for all to see . Wow, somehow I missed this thread. It offered a great little visual day-trip during my lunch break today. For anyone else headed here, add the Sheboygan Farmers Market to your list. The Hmong population has a big presence at this market and they display their flowers, fruits and vegetables so artistically. I was less impressed than you were with Charcoal Inn's buttery brats. Maybe our mistake was stopping in for bratwurst on a Friday, when the place was filled with folks ordering the fish fry, but the brat was flat, thin and lacked any charcoal character. 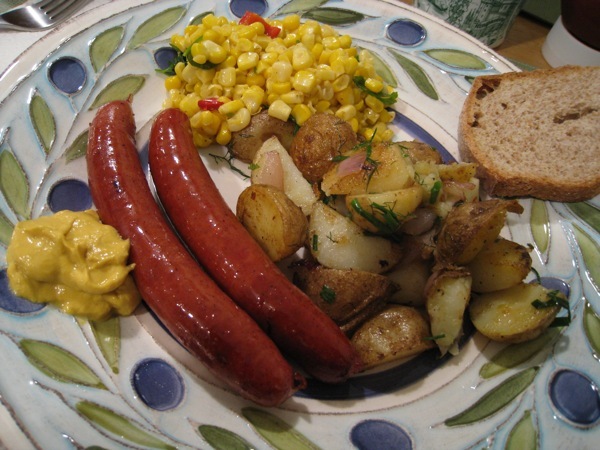 It didn't seem as flavorful as the Miesfeld bratwurst we later cooked at home, either, so perhaps they have switched suppliers, or perhaps it was just that all that butter masked the taste of the meat. 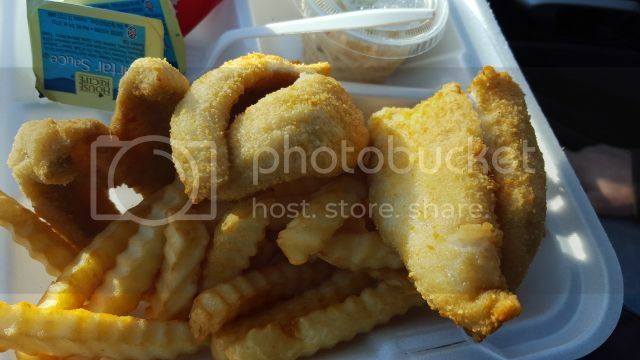 On the other hand, the platters of fried fish going past looked wonderful, and I regretted that we had dinner plans and were just stopping in for a snack. It's sad to hear you got a bad bratwurst in Sheboygan. Charcoal Inn still uses Miesfeld's. Did you order a single or double? I was mistaken when I wrote Charcoal Inn North is the original. 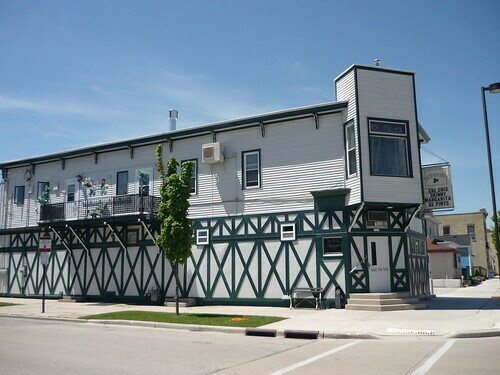 The current owners opened Charcoal Inn on 8th Street in 1984 followed by Charcoal Inn North on Geele Avenue in 1987. 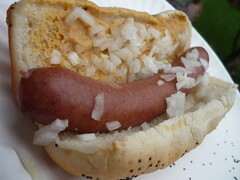 Rene G wrote: It's sad to hear you got a bad bratwurst in Sheboygan. Charcoal Inn still uses Miesfeld's. Did you order a single or double? A single. It really was just a snack. I do wonder whether they don't bother to fire up the grill on Fridays. No one else int the restaurant had anything but fish fry. Last weekend at the South location, I ordered a single brat. It was a patty, not a wurst. I didn't see wurst on the menu. 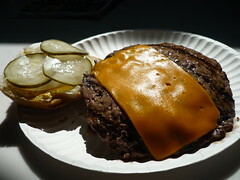 I preferred the brat patty to the steak sandwich, however, which I had trouble distinguishing from an overcooked hamburger. The butter IS over the top, but makes you feel like Wisconsin. One visit to the Bratwurst Capital of the World hardly makes me an expert but I understand the locals like to eat their brats in pairs. 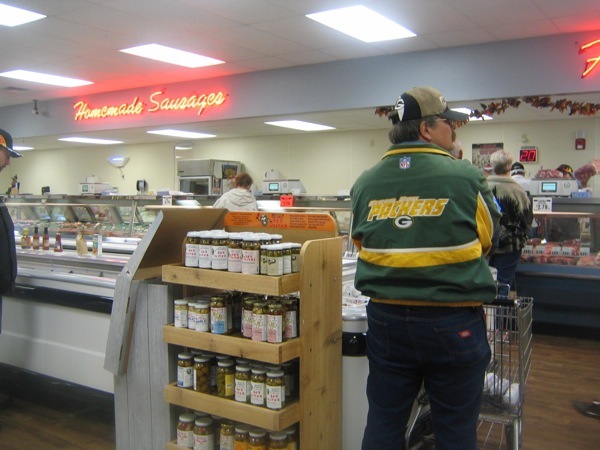 According to Charles K Miesfeld III, fourth-generation Sheboygan bratwurst manufacturer, "It's a mortal sin here if you order a single.'' So maybe it's not surprising the sturdy semmel and abundant butter overwhelmed your lone link. But if they weren't grilled over coals it's probably just as well you didn't get a double. The Charcoal Inn brats (a double) I sampled earlier this year were well charred and delicious but next time I'll ask them to go a little easy on the butter. Food Nut wrote: Last weekend at the South location, I ordered a single brat. It was a patty, not a wurst. Interesting. Could it be a single is a patty and a double is a pair of butterflied links? That might explain LAZ's description of her single as flat and thin. 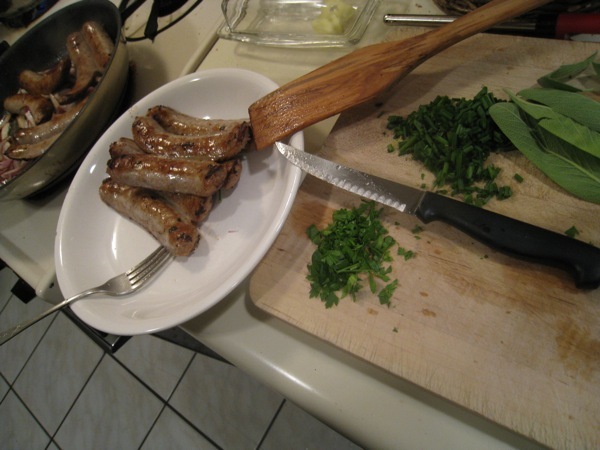 So much to learn about bratwurst…. 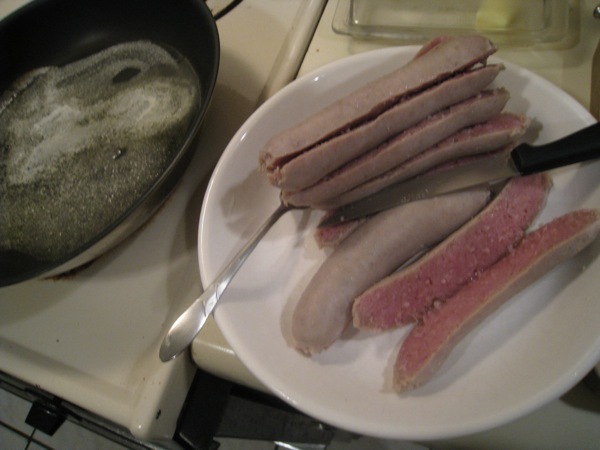 Rene G: "So much to learn about bratwurst." Now THAT needs to be gilded and enshrined! Rene G wrote: Interesting. Could it be a single is a patty and a double is a pair of butterflied links? That might explain LAZ's description of her single as flat and thin. No, it was a link that had been split down the middle and served butterflied on a hard roll. That was what I expected. But it had the appearance of having been flattened. Just an FYI, pretty much all of these places are closed on Sunday. Sheboygan is pretty much a ghost town on Sundays. Just wanted to save some people the disappointment/time that I experienced yesterday. Call before getting off the highway. 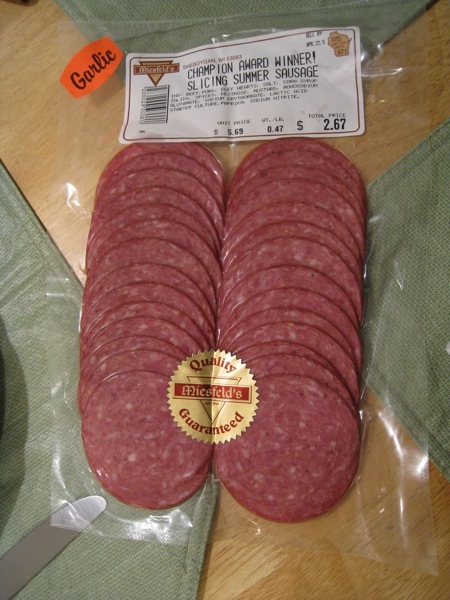 While they have raised their prices, the Old Wisconsin sausage outlet often has some large bags of over-runs fairly cheap. My father used to love the "duke of devon" Pub on the waterfront for fish and chips. If you do go to meisfields, also spend the time to run to Newton meats about 15 miles up the road, and as long as you are that far, Pine River Cheese. Toy's has been a long time favorite of mine. Unfortunately, our trip to Sheboygan this weekend, only involved a Saturday night. By the time we got there, and hit Legend Larry for some wings, everything was closed, and also closed on Sunday. We did make it to a place called Tommy's for a brat fry which was outstanding. I of course got the double, didn't want to be tossed out of the place! But, for anyone that finds themselves in this situation, there is a little shop on the highway called Say Cheese. 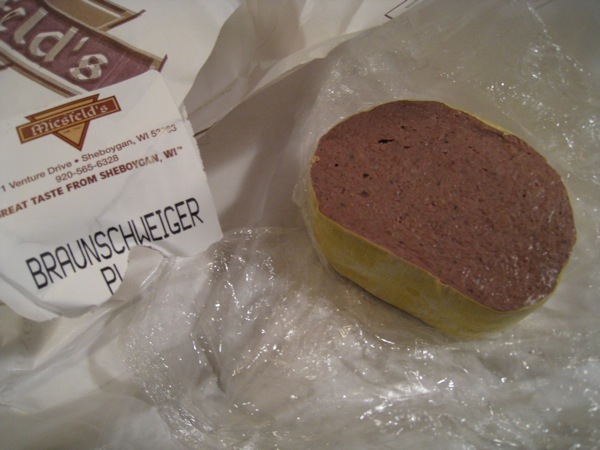 When we drove up to it, I thought oh man this is so small compared to Miesfeld's Meat Market. However, they had everything and more than we needed. Miesfelds brats and steak patties, cheeses, City Market hard rolls. And I seriously had the best hot ham and cheese sandwich in my life. They have fresh hot ham sliced to order, will put any cheese you want on a hard roll. They layer the ham then cheese, then ham, then cheese again, toast it all up. Had mine with some spicy mustard and cheddar. All ham sandwiches from this day forward will be measured to this as my gold standard. 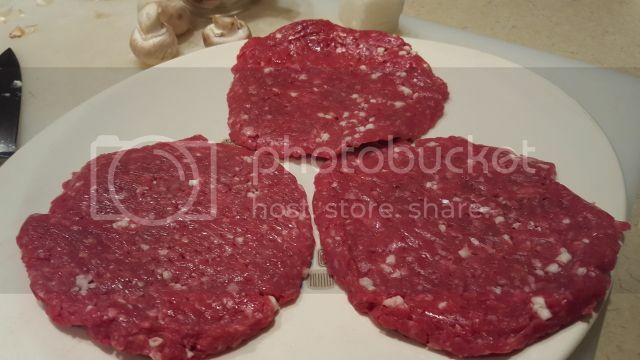 I made a meat run to Miesfeld's yesterday. Picked up a bunch of stuff including wieners, restaurant steaks, bacon and brats. 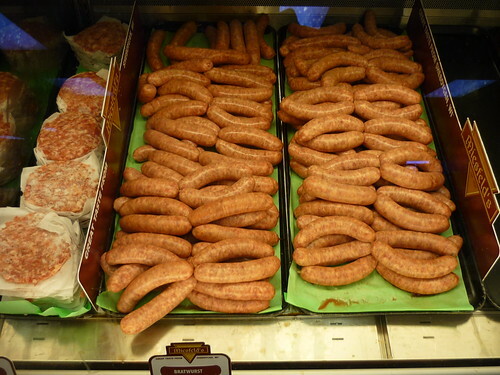 In addition to their superb 8/lb natural casing wieners, they also now have a 4/lb. version. I picked up a few to test drive for the football game today. After Miesfeld's, I had to make a stop at Charcoal Inn. 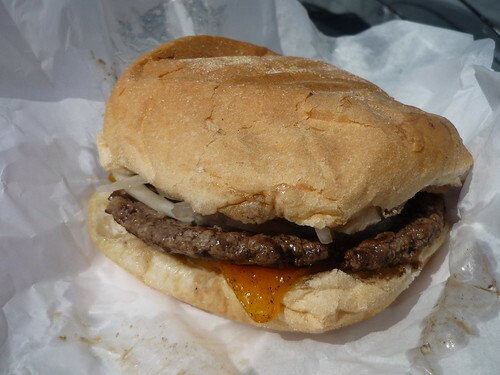 This time, instead of the traditional LTH order of a double brat, I got a steak sandwich and onion rings. The Meisfeld's Restaurant Steaks that they use for the sandwich are really good, and I'm glad that I had a cooler full of them in my car waiting to come home with me. The onion rings, on the other hand, seemed to be previously frozen and nothing to write home about. Still, it's always nice to pay a visit to Sheboygan. 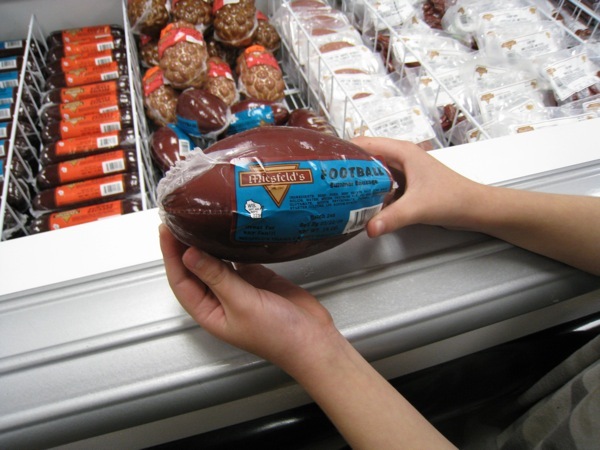 stevez wrote: I made a meat run to Miesfeld's yesterday. Picked up a bunch of stuff including wieners, restaurant steaks, bacon and brats. Steve kindly picked up a few things for me on his Miesfeld's run, brats, hot dogs and restaurant steaks. Like the brats, absolutely love the hot dogs but, surprisingly, had not tried restaurant steaks until today. Winner winner restaurant steak early dinner. I had not been up to Sheboygan in a couple years - frickin' mistake. 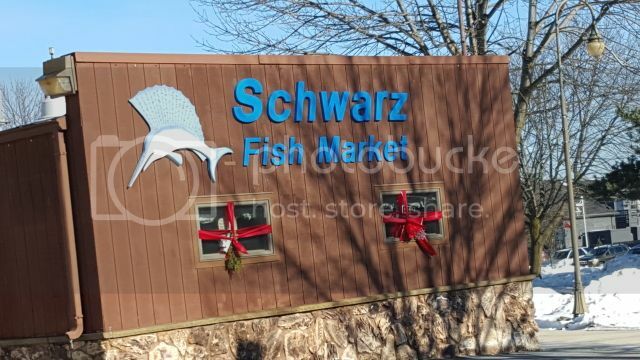 - Had some decent perch at another spot - nowhere near as good as Gosse's, but still good - just a little dry for my tastes, also no lemon wedges, and Sysco tartar - Schwarz Fish Co.
Small perch plate - not bad - just not great. Hoping to roll back up ASAP - maybe this Sat. anyone have any intel on this spot in Sheboygan Falls, -? That Saturday this was our first stop in town (for 2 wings & some eggrolls for a snack) - turns out it was also our 3rd stop in town - as its right down the street from Gosse's - to get 3 more stuffed wings for the road - bought out the rest they had. Not sure when I am rolling back up to this area, but I have some more places to cross off my list - also a bunch of supper clubs within easy reach.